SPIRITUAL WARFARE IS REAL 1 Peter 5: 8 the Apostle Peter said, "Be sober, be vigilant; because your adversary the devil, as a roaring lion, walketh about, seeking whom he may devour." The devil wants to hide him self from view as he destroys lives and causes many to stumble in this life. He has a purposed attack against the body of Christ and Paul said "for we are not ignorant of his devices." My assignment is to expose Satan and reveal the purpose of his attack which is to diminish the work of God by being a distraction. Men and women need to know who our real enemy is "For we wrestle not against flesh and blood, but against principalities, against powers, against the rulers of the darkness of this world, against spiritual wickedness in high places" (Eph.6:12). Man is not our enemy, the real enemies are the world (James 4:1-4), flesh (1 Pet.4:1-4), the devil (1 Pet.5:8) and invisible foes (Eph.6:12). We must arm ourselves with God's weaponry and stop fighting each other; we've got a devil to fight. 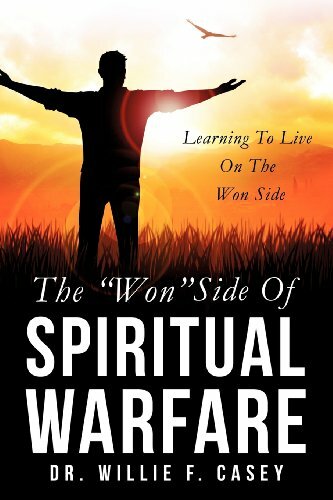 This book "The "Won" Side of Spiritual Warfare" (learning to live on the won side) is to equip the saints with revelation knowledge of the real perpetrator of all the evil in the world. We are on the "won" side and triumph in Christ. Dr. Willie F. Casey is a pastor, an educator, and a communicator of God's Word. Began ministry in 1986 and pastoring in 1990 at the New Beginning Christian Church located in Carrollton, Michigan & has ministered by radio And television over the years. He has earned degrees from The Full Gospel Christian Bible College in Flint, Michigan. Dr. Casey is married to his wife Ida And reside in Saginaw, Michigan. If you have any questions about this product by Brand: Xulon Press, contact us by completing and submitting the form below. If you are looking for a specif part number, please include it with your message.